The Company’s Board of Directors is responsible for the matters stated in Section 134(5) of the Companies Act, 2013 (“the Act”) with respect to the preparation of these consolidated financial statements that give a true and fair view of the financial position, financial performance and cash flows of the Group in accordance with the accounting principles generally accepted in India, including the Accounting Standards specified under section 133 of the Act, read with rule 7 of the Companies (Accounts) Rules, 2014. This responsibility also includes maintenance of adequate accounting records in accordance with the provisions of the Act for safeguarding the assets of the Group and for preventing and detecting frauds and other irregularities; selection and application of the appropriate accounting policies; making judgements and estimates that are reasonable and prudent; and the design, implementation and maintenance of adequate internal financial controls, that were operating effectively for ensuring the accuracy and completeness of the accounting records, relevant to the preparation and presentation of the consolidated financial statements that give a true and fair view and are free from material misstatement, whether due to fraud or error. We conducted our audit in accordance with the Standards on Auditing specified under Section 143(10) of the Act. Those standards require that we comply with ethical requirements and plan and perform the audit to obtain reasonable assurance about whether the consolidated financial statements are free from material misstatements. controls. An audit also includes evaluating the appropriateness of accounting policies used and the reasonableness of the accounting estimates made by the Company’s Directors, as well as evaluating the overall presentation of the consolidated financial statements. 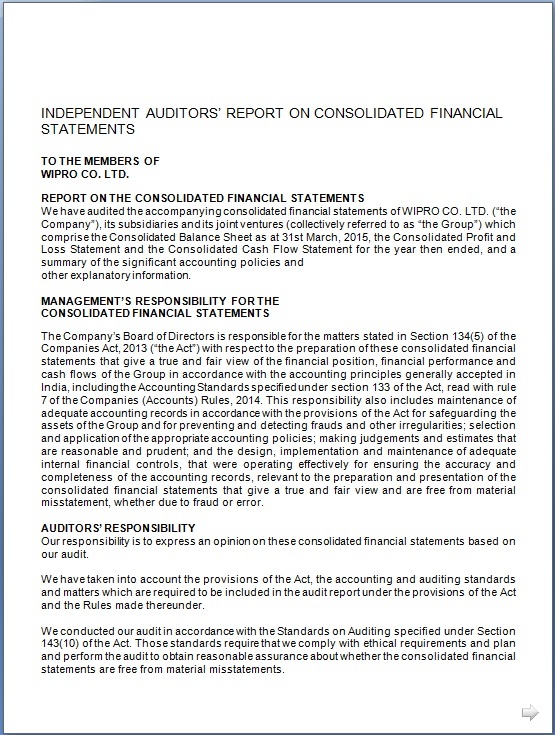 In our opinion and to the best of our information and according to the explanations given to us, and based on the consideration of the reports of other auditors, on the financial statements consolidated financial statements of the subsidiaries and associates noted below, the aforesaid consolidated financial statements give the information required by the Act in the manner so required and give a true and fair view in conformity with the accounting principles generally accepted in India, of the consolidated state of affairs of the Group as at 31st March, 2015, and its consolidated profit and its consolidated cash flows for the year ended on that date.